This fun text-based design for birders reads "Practiced in the Art of Twitchcraft." Do you have really great luck with twitching rarities? Or perhaps could More... you use some twitching mojo and this design would be an ironic statement? 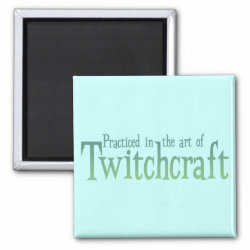 If you twitch a lot, this funny design is for you -- successful or not! The practicing is what it's all about. The chase is almost as fun as the actual tick, right? RIGHT?